The idea, at first, seemed absurd. Tom Izzo as Michigan State's football coach? 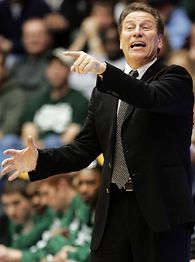 Izzo, who has spent 12 years as MSU's basketball coach and has taken the Spartans to four Final Fours, started a slight uproar in Michigan on Monday when he didn't exactly shoot down the idea of taking over the football team. Tom Izzo is one of the nation's best talent evaluators and motivators. Why couldn't he be a successful football coach? The story abated after a few soft denials from Izzo, who is the best friend of Steve Mariucci, and the MSU administration. With a hint of sadness in his eyes, Izzo finally called the idea "far-fetched." Now, the idea of Izzo coaching MSU football is ridiculous because he has turned the school's basketball team into an elite power. His legacy at MSU is cemented and if there were was a scenario in which Izzo could get fired, it would be if he took over a football program that has epitomized mediocrity for decades. But the idea of a basketball coach also leading a football program has more merit than you think. It's out there, but not so out there that the possibility can't even be considered. Think about the most successful coaches in sports. What did they all have in common? It wasn't their knowledge of X's and O's. It was their ability to lead, motivate and manage  traits you need no matter what or where you coach. Phil Jackson's nine NBA titles weren't because of the triangle offense. Dean Smith didn't become the winningest coach in college basketball because of the way he used the four corners to ice victories. Both certainly had some of the greatest players ever  Michael Jordan (for both), James Worthy, Shaq and Kobe  but they excelled because they could handle massive egos and make them buy into team success. Are Pete Carroll's blitz packages and offensive schemes any more complicated at USC than they were when he coached the New England Patriots? No. The difference is his rah-rah, laid-back demeanor wasn't working with NFL players, but it registers big with the iPod generation he coaches now. Not to oversimplify what football coaches do, but their success or failure hinges on concepts that aren't foreign to any coach. They must be able to evaluate talent  both for their coaching staff and their team. So conceivably, couldn't a basketball coach recognize 4.2 speed just as easily as a football coach? And likewise, wouldn't a football coach be able to decipher that Greg Oden will be one of the most skilled big men to play college basketball in years? Rocket science, this stuff ain't. The game is so high-tech, with coaches having so many assistants, analysts and even a chart that tells them when to attempt a two-point conversion, how much thinking can you say a head football coach does anymore? This is not to say any basketball coach is capable of coaching football. Or, vice versa. But someone like Izzo might have had a chance since this is the same guy who is known for using football pads during rebounding drills. Mike Krzyzewski: You know the résumé. He graduated from West Point and was an Army officer for five years. Coach K wouldn't do any worse than the other coaches Duke football has had over the years. Phil Jackson: He knows how to deal with superstars, including knuckleheads like Dennis Rodman. A perfect fit for the University of Miami's football program. Mark Cuban: He may not be a coach (sideline antics notwithstanding), but he would bring Daniel Snyder money paired with common sense. Steve Spurrier: As a basketball coach, the Fun 'n' Gun would become the Fun 'n' Run. Are you going to tell us someone as intense as Bill Laimbeer couldn't succeed in the football world? 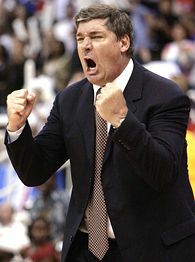 Bill Laimbeer: He has won two titles as coach of the WNBA's Detroit Shock, and Robert Parish can attest to his nasty clothesline. In light of all the stupid personnel moves Lions president Matt Millen has made, Laimbeer would be an upgrade in Motown. Bill Parcells: He has coached Terrell Owens and Lawrence Taylor and worked for Jerry Jones. Imagine what he do could with the Portland Trail Blazers. Bob Knight: Could be the answer to the Texans' problems, although I would love to see what happened if Knight gave Mario Williams the same love tap he gave Michael Prince. Bill Belichick and Patriots owner Bob Kraft: Good Lord do the Knicks need them. John Thompson: His Georgetown teams were rugged enough to make the NFL playoffs. He's intimidating and sharp. Suited best for the Dallas Cowboys, a team which requires a coach with a commanding presence. Pat Summitt: Not only does she possess the glare of death, but few coaches maximize a player's talent the way she does. Bet if she stared down Eli Manning, he would get his act together. Rick Majerus: Brilliant strategist, and you know the team meals would be terrific. He's a Big Ten football coach waiting to happen. Larry Brown: Sure, he's a diva, a whiner, a complainer and generally not happy unless he's miserable. But if he can get Aaron McKie, Tyrone Hill, George Lynch and a withered Dikembe Mutombo to the NBA Finals, then what could he do with the glut of undercoached talent at Florida State? Brown's offense would definitely be more productive than Jeff Bowden's. John Chaney: That leaping choke move he put on John Calipari is perfectly legal in football and if Chaney cursed out Michael Vick like he did Calipari, maybe Vick wouldn't be a "coach killer." Bill Cowher: One of the best talent evaluators in the NFL. The chin would be a big hit with Boston Celtics fans. Much better than Doc Rivers' constant look of confusion. Jemele Hill is a columnist for Page 2 and writer for ESPN the Magazine. She can be reached at jemeleespn@gmail.com.